What’s the best way to answer a reference question by email? Greeting – Say hello and use the person’s name if you know it. Makes the transaction more personal. Give an answer – Use simple steps, URL links, screen capture images, anything else to make the patron’s job easier to find the information they are looking for. Describe how you found the answer – This is your change to have a teaching moment and show the patron how they could find the answer next time on their own. You’d be surprised how grateful people are when you go this extra mile. Provide follow-up help – Let the patron know that they can always come back for more help if they have any questions or if the answer wasn’t quite what they were looking for. Give contact information, again to make it easier for the patron. 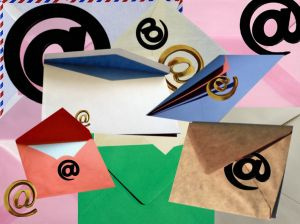 Say goodbye – It’s nice to give a goodbye greeting to make the email transaction more personal. I came away with some questions after answering my first email at the USciences reference desk. We discussed many of these ideas in my virtual reference class but I am still trying to find satisfying answers. How much information is TOO much information for an answer? At what point will the patron stop reading your email answer? When it is too long? Filled with too much jargon? Not formatted in a readable way? Can this question even be answered properly through email? Or do you need to suggest a phone/in-person meeting to discuss the answer/information need? What’s the best way to go about that? How can you tell if the patron is asking for what they really need? Reference librarians know that most patrons don’t ask for what they want right away. You have to ask them questions to get to the root of their need. With email, it’s hard to ask the patron for clarification, especially when the patron may never respond back. Librarians – what kinds of concerns/questions do you have about email reference?